The annual pace of inflation edged higher in February as gains in most spending categories offset lower gasoline prices, Statistics Canada said Friday. The federal data agency said the consumer price index climbed 1.5 per cent last month compared to the same month a year ago. The move compared with a year-over-over increase of 1.4 per cent in January. Economists had expected a reading of 1.4 per cent. 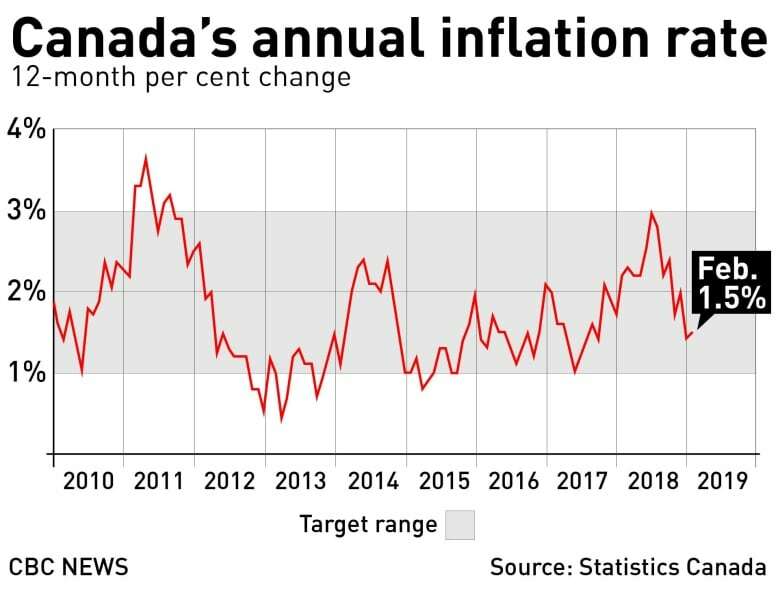 Josh Nye, senior economist at the Royal Bank, said the slow pace of inflation will mean the Bank of Canada will likely remain patient when it comes to raising interest rates. “With inflation remaining below two per cent now, we think that’s going to mean a pause from the Bank of Canada,” Nye said. Helping push costs higher was a 8.1 per cent increase in mortgage interest costs and a 14.3 per cent rise compared with a year ago in the cost of fresh vegetables. The cost of passenger vehicle insurance premiums also rose 6.3 per cent. The cost of gasoline was down 11.9 per cent compared with the same month last year, as overall energy prices slipped 5.7 per cent. However, Statistics Canada said tighter oil supplies and the temporary closure of several refineries for seasonal maintenance helped boost gasoline prices 1.9 per cent compared with January, the first month-over-month increase in gasoline since July 2018. Excluding gasoline, the annual pace of inflation held steady at 2.1 per cent, the same as January. The report also said the average of the Bank of Canada’s three core inflation readings, which omit more-volatile items such as gas, edged down to 1.8 per cent compared with a reading of 1.9 per cent in January. He said core inflation has been modestly below two per cent since August last year. The central bank, which aims to keep inflation between one and three per cent, sets its benchmark interest rate target as a way to manage the pace of inflation. During its rate announcement earlier this month, the Bank of Canada held its key target at 1.75 per cent, when it also raised concerns about the strength of economic growth to start the year. In a separate report, Statistics Canada said Friday that retail sales fell 0.3 per cent to $50.1 billion in January, the third consecutive move lower as falling sales at motor vehicle and parts dealers weighed on the results. Analysts had estimated a month-over-month increase of 0.4 per cent, according to Thomson Reuters Eikon. Sales at motor vehicle and parts dealers fell 1.5 per cent in January due to a 2.4 per cent drop in sales at new car dealers and a 2.7 per cent drop at used car dealers. Excluding that subsector, retail sales increased 0.1 per cent. Retail sales in volume terms were essentially unchanged in January.